UPDATED: Sun., March 11, 2018, 4:11 p.m.
PARIS – French far-right leader Marine Le Pen proposed renaming the National Front party co-founded by her father 46 years ago to National Rally, opening a new era after her resounding defeat in last year’s presidential race. 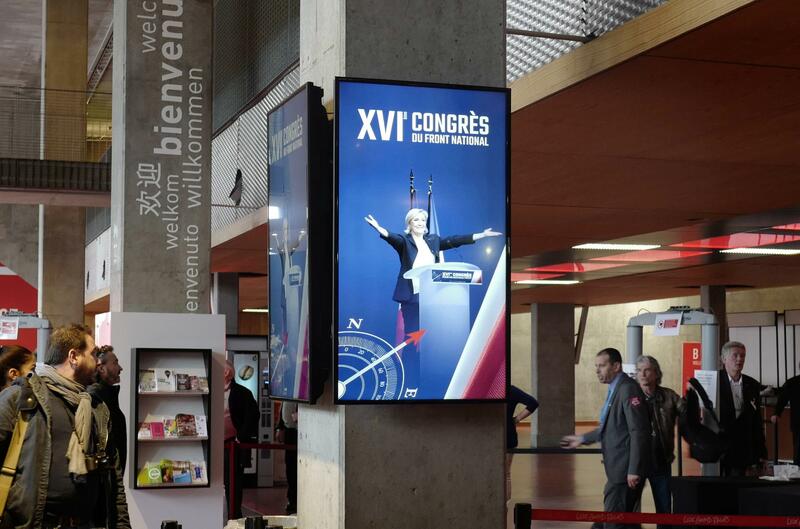 Le Pen’s proposal culminated her closing speech at the party’s two-day congress in Lille, the capital of the National Front’s northern heartland. The name National Rally must be approved by party members in a mail vote and it’s not clear whether they will accept the change. In another decisive change, the party severed the final ties to firebrand founder Jean-Marie Le Pen, 89, by eliminating his title of honorary president-for-life. He was barred from attending the congress. The moves were part of a makeover designed to revive the nationalist party’s fortunes after Marine Le Pen’s resounding loss in last year’s presidential election to Emmanuel Macron. After her defeat, Le Pen had promised a “re-foundation” of the party. New faces appeared within the leadership and new bylaws were voted on. But the party’s foundation, notably its anti-immigration agenda, remained intact. However, Le Pen’s party reset had an immediate setback when a young official who was appointed last fall as an “ambassador for the re-foundation” was suspended for allegedly using racial slurs. A video on social networks showed an agitated man identified as Rodriguez making a racial slur and being calmed. In another video, a black man recounts racial insults he said were proffered. Since taking over in 2011, Le Pen has worked to remove the stigma of racism and anti-Semitism attached to the National Front under her father’s leadership. The party, she said, has moved from a protest movement to opposition. Now, she wants it to create alliances and be seen as a party that can govern. However, she also had to assured members who fear the party is moving away from its core. She defended the French identity and what she painted as the dark forces that threaten it. “Globalization and Islamization are two ideologies that want to dominate the world,” she said to cheers. Le Pen hammered away at Macron, an upstart centrist and former investment banker, in her 80-minute speech as the incarnation of globalization that her party is battling. The party leader touched the chord that has resonated with sympathizers for decades, protecting France’s secular values that she claimed are being destroyed by immigration, notably by Muslims. “In France, when you’re a foreigner, you respect our laws … When you’re a foreigner and a delinquent, you must get on a plane,” she said, drawing cries of “On est chez nous” (We are in our land). The National Front of the past has been a political force for decades, a kingmaker in numerous elections and a key player in others under Le Pen, notably for the European Parliament, where it won more seats than any French party. But Marine Le Pen herself may have credibility issues. Her conservative niece popular with traditional Catholics, Marion Marechal-Le Pen – voted most popular at the previous congress – was heaped with praise by special guest Steve Bannon, U.S. President Donald Trump’s former top strategist, during a surprise appearance Saturday. Marine Le Pen said recently that she is not opposed to ceding her leadership but wants to stay on for at least three more years. In a nod to the apparently large contingent of members opposed to a name change, Le Pen noted that the National Front name, which the party has had since its founding in 1972, is linked to a “glorious” past. However, she said it serves as a psychological barrier for potential new members and voters, notably the word “front,” which connotes opposition. Despite her troubles, Marine Le Pen was re-elected to a new term as party president at the congress – the only candidate for the post. Published: March 11, 2018, 8:37 a.m. Updated: March 11, 2018, 4:11 p.m.